Landscape painting was not always there. It had to be invented, like any other idea. The world of solid things surrounds us in durable or fleeting forms, but the notion to portray the world had to be concocted. It had a beginning. It’s not that nature wasn’t noticed – indeed, to dwellers in pre-history the particularities of terrain spoke as urgently as to the eye of an infantry general. But for eons there was no incentive to create a visual language to transcribe what the eye saw. How to record something that exists as the sum of many impressions? People rarely take snapshots with their eyes, fixing a unique configuration. We assemble our sense of the cosmos from buts of information and memorable views. Cubism, for instance, is how we see people. Landscape is not obvious. It is extremely artificial and depends on many assumptions – moral, conceptual, and experiential. Throughout the Middle Ages, landscape was either a nuisance of rugged terrain or pastoral gentleness, populated by either outlandish or divine images. For the Egyptians, Greeks, and Romans – all adept at modeling human and animal figures – mountains were seen as getting in the way of commerce, travel, warfare, and farming, not as artistic muses. Paintings like Merrill Mahaffey’s would have been incomprehensible. But this attitude eventually changed, and the landscape came to be considered self-sufficient cause for art. In his 1604 essay on painting, for example, Flemish painter Karel van Mander exhorted young urban artists to study in the countryside, to extract nature’s essence and reproduce it back in the studio. That was a new idea in Europe, though old in China or Japan. In Rembrandt’s Holland or in eastern Asia, Mahaffey’s painting would not have seemed alien or novel and could have been judged upon their merits. Merrill Mahaffey, Canyon Temples, acrylic, 46"x68"
The merits of Mahaffey’s paintings are many: thoughtful paint handling, apt color schemes, a fine tonal range, and wide textural possibilities. Unlike earlier landscape paintings that recorded the land’s marvels such as the Grand Canyon, Niagara Falls, or the Matterhorn and often portrayed nature at its most tempestuous – blasted trees, raging clouds, erupting mountains, and other phenomena – Mahaffey’s works derive their mood from the absence of turmoil and not from claims that an anonymous spot is a magical portal giving us access to the inner psyche of the universe. Mahaffey is not sending back souvenir postcards from his voyages. Though he is an observant naturalist and inspired conservationist, his paintings are not posters. These self-sufficient paintings do not suggest that their strength or creativity comes from the land; they are independent works of art. Merrill Mahaffey, Redstone (1999), acrylic, 28"x56"
Today the best landscape art remains amoral. Only the choice of subject indicates extra-pictorial values. We surmise that Mahaffey’s paintings imply a reverence for what is beheld; the subject is worthy and should be conserved. Even with the best artists, though, there’s a certain arbitrariness in what to paint, and the choice of subject matter can be minor – a mere choice of something to look at. Yet many people would prefer landscape painting to preach, to give lessons, to testify on behalf of a particular cause or political philosophy. To some the land still speaks this way, and this is no light matter. It situates the modern landscape painter at a precarious political juncture and within a powerful struggle for intellectual development. More interesting than this part, landscape painting is being constantly reformulated to make it more apt, just as portraiture of any kind has to be re-imagined and altered as we redefine ourselves. Merely looking at the land is no longer original, and particular landscape features carry no value; but how the view is reported is crucial. The weightiness of that choice – its burden, awe, and reverence – is human and mental. It is not, after all these ages of worship, the simple expression of amazement at nature’s gift, although amazement at the land probably conditions Mahaffey’s paintings. 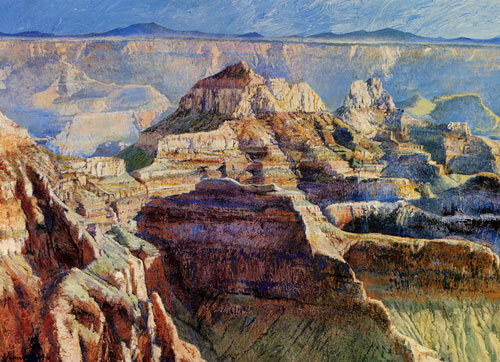 Mahaffey could also have chosen to paint abstract art, or fruit, or nudes, but instead he has staked a claim to the land, betting that unsuspected artistic riches can be unearthed from long-exploited territory. 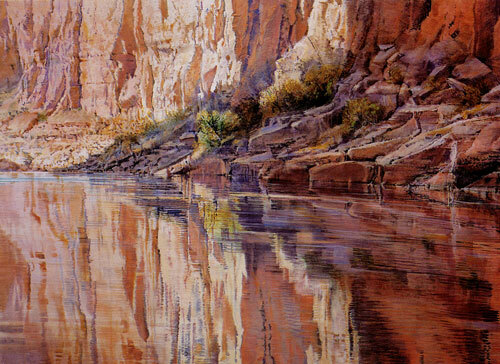 Merrill Mahaffey, Canyon Reflection (1999), acrylic, 20"x84"
Who human beings are – dupes of Providence or puny masters of fate – is being constantly re-imagined, as circumstance and thought require. Thus in some ways, at this moment, landscape painting seems an especially odd enterprise. It is not an obviously modernist experiment tending toward irreducible absolutes. Landscape can be easily co-opted by those who utter their projections and fantasies about the land, its ownership, rights, and responsibilities. And, although theoretically like the flag the land belongs to all, only some have staked a moral claim here. This is especially interesting when the landscape in question is the West, where both history and morality displace geography. Merrill Mahaffey understands these complex issues and in their service has created a body of landscape paintings that gratify the spectator in a way that the land itself cannot.